The following article is a re-post from Sadlier’s article, How to Integrate STREAM Curriculum into Religious Education. If you’re in a Catholic School, you’ve likely heard the acronym STEM for many years. Simply, STEM stands for Science, Technology, Engineering and Mathematics. STEM is a curriculum that is based on these four disciplines and their integration. Though STEM education has long been a part of curriculum in the United States, in recent years the efforts of integrating these – and other – subject areas has come to the forefront. Download and share the What is STREAM? Faith Fact among the administrators, teachers, families, and students in your religious education program! What is STREAM in Education? The STEM acronym was first used in the year 2001. And then, it became STEAM. The insertion of the “A” represents the Arts, which some critics of STEM felt was a vital component missing from STEM. Today, you will often see the inclusion of an “R,” changing STEAM to STREAM. “R” can represent Robotics, or Reading. For many Catholic schools and for the National Catholic Education Association, the “R” represents another critical link: Religion. 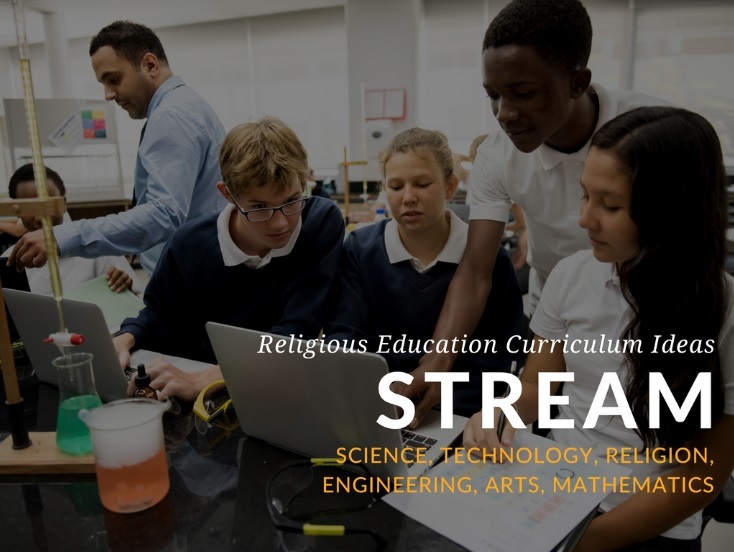 Successful STREAM curriculum strives to seamlessly integrate Religion into the STEAM content areas of Science, Technology, Engineering, Arts and Mathematics and is an effort that requires school wide planning, support, communication, and development. 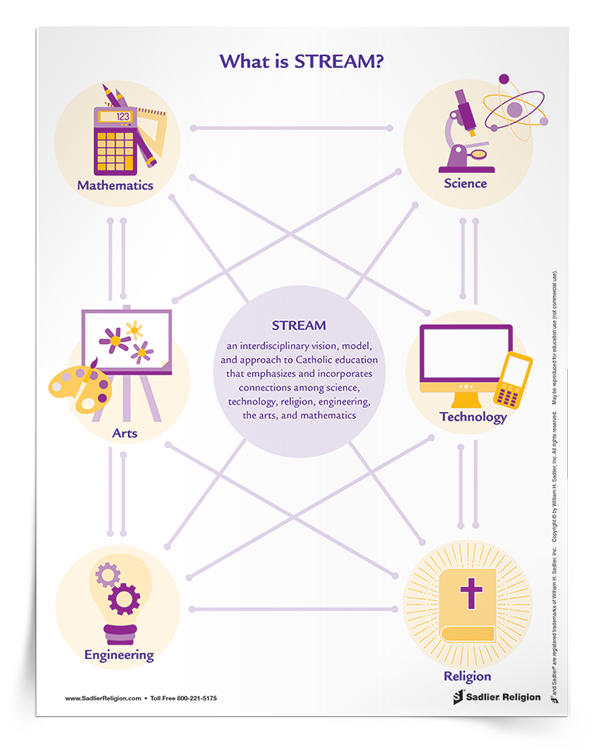 STREAM curriculum models incorporate the lens of faith and God in all things into its approach. If you’re considering STREAM learning as a framework, find inspiration from the NCEA web site, which offers resources such as case studies, FAQs, models, and session ideas, as well as a symposium. If you’re taking a first step at implementing STREAM learning in your Catholic School or diocese, small curriculum efforts linking the disciplines will help students and families make big connections. Show your students that Science, Technology, Religion, Engineering, Arts, and Mathematics all work together as part of God’s design. Here are some ideas to get you started with STREAM in your Religious Education curriculum! Explore saints who had connections to STREAM disciplines. For example, Saint Luke was a Physician, and Saint Hubert was a Franciscan Mathematician. You might also review with students the historical lineage of scientists who were also faithful Catholics, and their major contributions to both Science and the Church. Consider exploring scientists like Galileo, Rene Descartes, Copernicus, and Albert Magnus. Discuss the ways that the faith of these saints and scientists influenced their work in each discipline. Students might write a reflection on which STREAM discipline they are most interested or gifted in, and ways they might use that to benefit the Church and the world. Students might report on or present why scientific innovations and discoveries so important for us as Catholics in learning more about the world, and so, more about God. Teach students about the Pontifical Academy of the Sciences in Vatican City, and how it functions as a prestigious academic institution for research and discoveries in Science and Mathematics. As a Church we know that faith and science are partners. God is revealed through creation. Science allows us to study the world and come to know more about God. Make connections to the natural world through the creation stories. A guided nature walk could be an opportunity to catalog places in nature that children see God, a companion to their study of the natural world. Stewardship is a critical component of environmental education, and an area in which Pope Francis has focused during his papacy and for which resources abound. 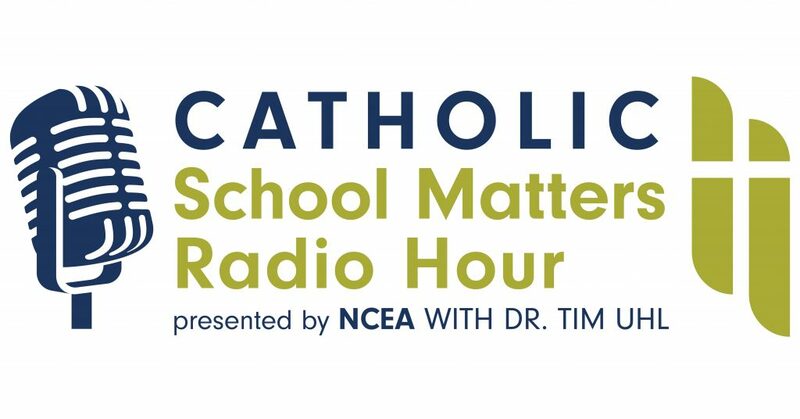 Help students understand that the Catholic principles that guide our communication and interaction with others in the physical world applies to the digital world, too. Our responsible, safe use and consumption of digital materials has important links between our faith and technology. Ask students to develop a multimedia presentation to teach their peers and classmates about this or one of the themes explored in your Religious Education program. Explain that engineers build places for us to worship, or meet and feel God’s presence. 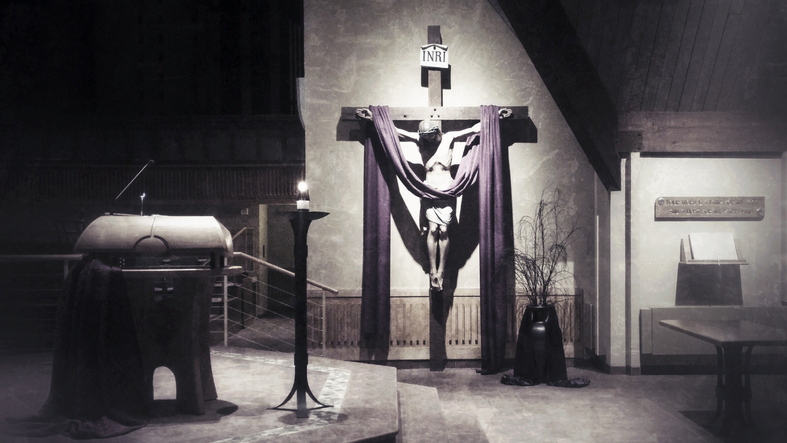 Take students on a tour of your local parish. Research the engineers and architects who built it, and learn more about their vision and the choices (both functional and artistic or stylistic) that went into building your parish. Bonus points if you can set up a time to interview or meet with the engineers themselves! You might invite students interested in engineering and architecture to plan and/or build a model parish church or Catholic school that supports your community’s many functions and aesthetics. 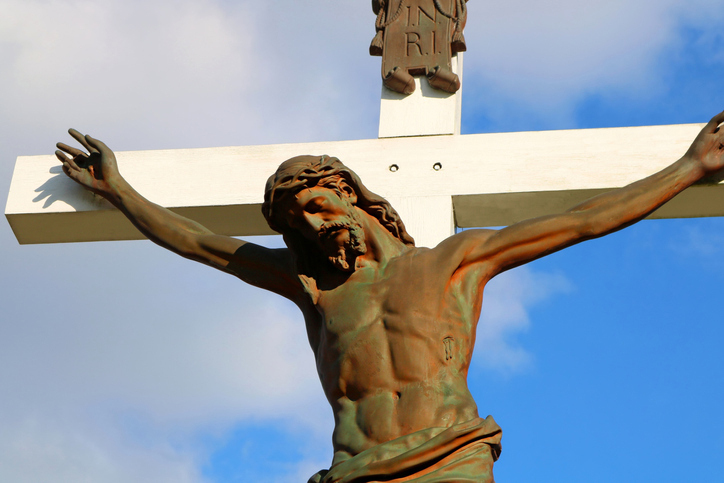 Throughout history, artists have relied on the fine arts to express faith. Stained glass windows were originally used to teach parishioners who could not read about faith as they attended Mass. A STREAM unit may explore how and why stained glass windows are designed, made and installed, and invite students to design their own windows using art materials like clear contact paper and colorful tissue papers. As an alternative, you might invite students to curate a class museum or exhibit which features religious artwork relating to themes studied across the curriculum. We can’t talk about Catholicism and Technology without talking about Pope Emeritus Benedict XVI’s council on the New Evangelization. Explain the concept of the New Evangelization and help students understand that millennial technology, especially the advent of social media, is a tool that can be leveraged for charge in this movement. Ask students to brainstorm ways they could use technology and social media to “go forth and proclaim the Gospel to all nations.” Invite them to actually to work in teams to put their plans into action. Engineering is at the heart of one of our central focuses as Catholics: social justice. One of the most beautiful contributions Catholicism has made to the Arts is in the area of liturgical and sacred music, which strongly ties to mathematics as well. Discuss how music helps us to worship, adore, and experience God on a deeper level. Invite students to work in groups to compose a song or write lyrics to a song they believe could be used for worship or liturgy. 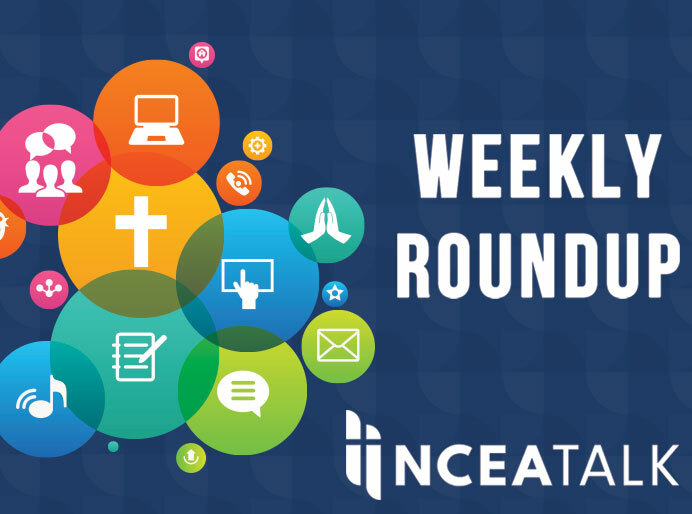 There are so many opportunities to make STREAM connections, whether your religious education program is considering incorporating small connections or implementing a community-wide effort. Download and share the What is STREAM? 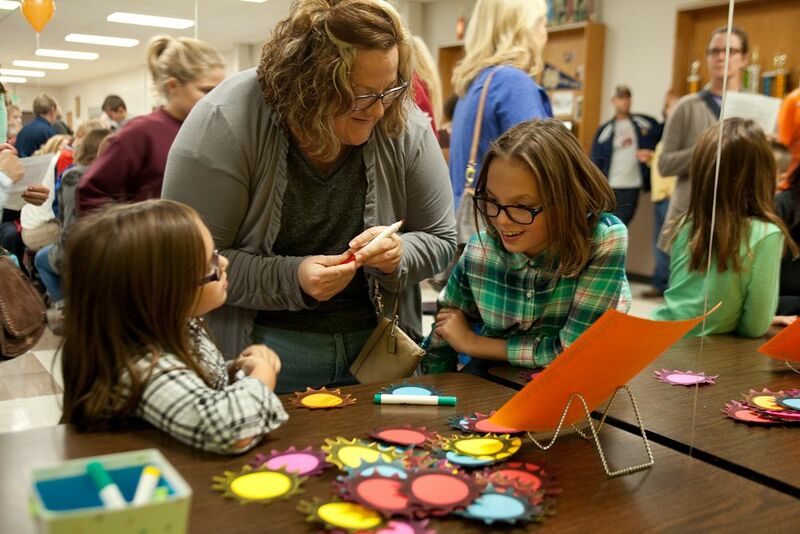 Faith Fact among the administrators, teachers, families, and students in your religious education program to explain and promote STREAM education in your community.